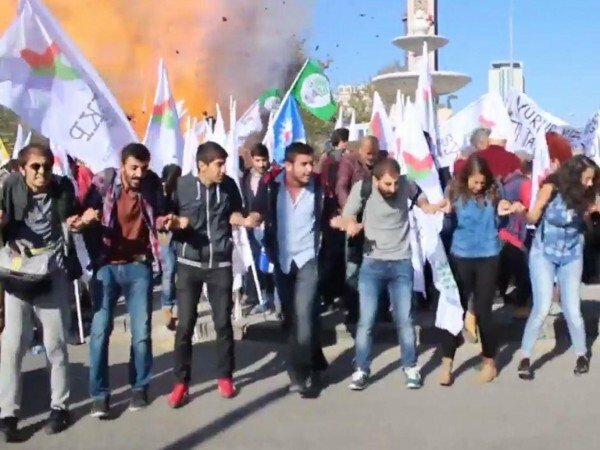 A peace rally in the Turkish capital Ankara has been hit by two explosions, causing multiple casualties, reports say. At least 20 people have been killed, Turkish news agency Dogan said. TV footage shows scenes of panic and people lying on the ground covered in blood, amid protest banners. The blasts took place near the city’s central train station. PM Ahmet Davutoglu is being briefed by the interior and health ministers, state news agency Anadolu says. The blasts were a terrorist attack and are investigating reports that a suicide bomber was behind at least one of the explosions, government officials say. The leader of the pro-Kurdish HDP party has blamed the state for the attack, and canceled all election rallies. The HDP was among those calling for Saturday’s rally for “peace and democracy”, which was due to start at 12:00 local time. The party tweeted that there were “numerous dead and injured”, and that police “attacked” people carrying the injured away. An HDP rally in the city of Diyarbakir was bombed in June, ahead of general elections. Turkey is holding another election next month.